The One and Only QA-Solutions E-zine, Please Subscribe! Subscribe to QA Solutions E-zine! QA Solutions E-Zine contains additional information that you cannot find on this website. 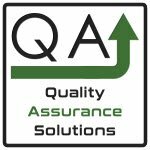 QA Solutions focuses on ISO 9001 tips, auditing tips, continuous improvement tools and all things related to Quality Assurance. An example of an ISO 9001 quality manual. An example of a process interaction chart which is necessary for ISO 9001 certification. Plus many more exclusive downloads for our readers! In addition, you will receive special discounts on future product offerings. See this page to review our Spam Protection Policy.